Stop by and check the shoreline of this small county park for Limpkin, Snowy Egret, Belted Kingfisher, Wood Duck and other waterbirds. 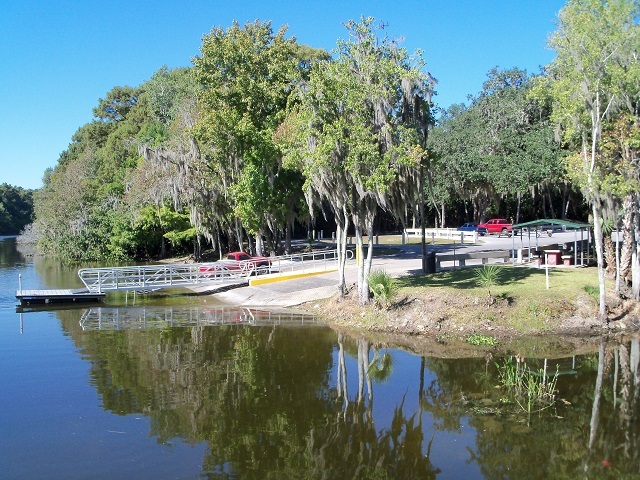 A boat launch allows access to a tributary of Lake Panasoffkee, and the adjacent hardwood hammock makes birding the edges of the property worthwhile in migration. Look and listen for Gray Catbirds Red-eyed Vireo, American Redstart, Northern Waterthrush and Indigo Bunting. Raptors such as Red-shouldered Hawk patrol the skies; numerous woodpecker species and common songbirds occur year round. In July and August flocks of Swallow-tailed Kites congregate in the area before they migrate south to Brazil for the winter. To extend your time here, visitors can access a network of unmarked roads suitable for hiking (seasonal flooding may occur). These roads run for several miles through the adjacent Panasoffkee Outlet, a 1,118-acre property owned by the Southwest Florida Water Management District (SWFWMD). The Panasoffkee Outlet borders 3 miles of pristine Withlacoochee River floodplain and contains a mixture of pine flatwoods, freshwater marsh and oak scrub. A second walk-in access point (no parking) is located on CR 315.